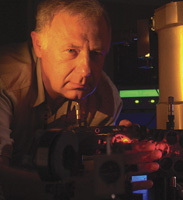 When the Department of Electrical and Computer Engineering hosts a high-profile seminar speaker, or a particularly promising faculty candidate, it is not unusual for Prof. Roman Sobolewski to take that person to see the Laboratory for Laser Energetics. “It is always very high on the agenda,” Sobolewski notes. And well it should be. LLE is not only impressive in its own right, but has a special importance for the Hajim School of Engineering and Applied Sciences. “The Lab is an incredibly important part of our University, and it is an incredible resource for engineering,” says Robert Clark, Dean of the Hajim School and the University’s Senior Vice President for Research. For example, funding through LLE accounted for about 73 percent of Hajim School research expenditures during FY 2013. Nineteen Hajim School faculty members are also listed as scientists at LLE. This includes tenured professors, like Sobolewski, who are also LLE senior scientists or scientists – and spend much, if not most of their time at LLE. It also includes scientists from LLE who teach classes at the River Campus. Robert McCrory, CEO and director of LLE, is also a professor of mechanical engineering and of physics. Several Hajim School graduate students are supported each year with federally funded Frank Horton Fellowships in Laser Energetics awarded by LLE. In 2009, for example, 21 of 39 fellowships went to students in mechanical engineering, electrical and computer engineering, chemical engineering and optics. Thirty Hajim School undergraduates this past school year worked at LLE on a variety of projects. This should come as no surprise. The LLE’s missions – including, first and foremost, the pursuit of inertial confinement fusion as a source of energy – involve engineering challenges, both theoretical and applied, that overlap nicely with the research interests of Hajim School faculty. The ties can be traced back to the very beginning of LLE. Initial research on high-power lasers by Michael Hercher, a doctoral student and later faculty member at the Institute of Optics, showed that a ruby laser could be focused in air and create a huge spark. Moshe Lubin, who joined the Department of Mechanical and Aerospace Sciences (now Department of Mechanical Engineering) in 1965, realized the laser approach was an ideal way to make and study plasma, as well as other high-energy-density phenomena. By 1970, Lubin (who later became LLE’s founding director) and his colleagues concluded that lasers could ignite thermonuclear reactions. During the early 1980s, optics and electrical engineering faculty members and graduate students played an important role in the Ultrafast Sciences Group. 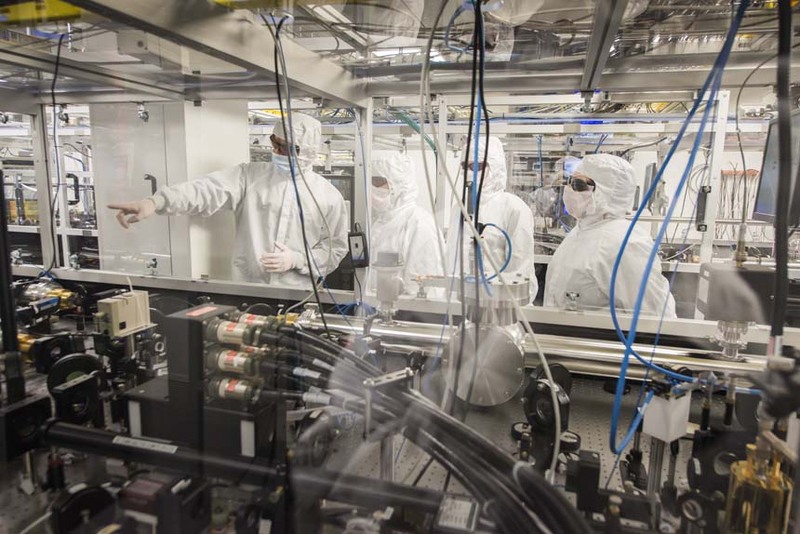 The group “contributed many firsts to LLE’s long list of innovations” -- including the technology that enabled the development of femtosecond petawatt lasers now used in the investigation of high-energy-density science. Ongoing collaborations with University faculty and students, including those from the Hajim School, “benefit LLE in two ways: by adding to LLE’s base of expertise and by providing LLE with access to graduate and undergraduate students,” notes the lab’s 40th anniversary report, published in 2010. For many students, the opportunity to do research at LLE has proved invaluable to their later careers. For example, Lee Feinberg ’87 (Optics), now optical telescope element manager for the James Webb space telescope project at NASA’s Goddard Space Flight Center, worked at LLE during his sophomore and junior year, helping to solve a problem that developed when the fusion energy lab switched from red to blue laser. 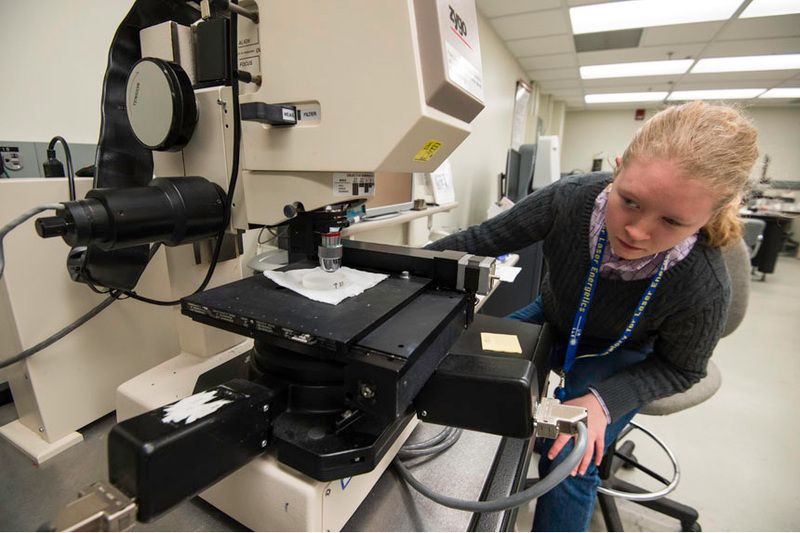 “That lab experience helped me to understand how interferometers and optical design software really work, which gave me great insight into commercial products used today," Feinberg notes. "That experience has been the key to helping me along my way." LLE also helps attract top graduate students and faculty to the Hajim School. Research associate Steven Ivancic is shown at the target chamber securing the extreme ultraviolet spectrometer to the Multi-Terawatt (MTW) laser target chamber. Its nose cone can be seen inside the target chamber. At right, four beamlines of OMEGA EP firing during a target shot. Riccardo Betti, professor of mechanical engineering and of physics, is a perfect example. His desire to perform fusion research brought him to Rochester. "Fusion experiments are very expensive, and the scale of the experiments usually are outside the normal scale of a university experiment," Betti said. "So there are only very few places that have fusion experiments of this scale and that are associated with a university." In Rochester, Betti said, he could find both. And both LLE and Hajim have benefited. Betti, recipient of the school’s Lifetime Achievement Award last year, was installed earlier this year as the Robert L. McCrory Professor at LLE. He has received the Ernest Orlando Award from the U.S. Department of Energy for a series of theoretical discoveries he made in the physics of inertial confinement fusion, and the Edward Teller Medal from the American Nuclear Society. He has been a frequent advisor to the federal government on the future of fusion. LLE’s mission also includes developing new laser and materials technologies, so it can support research in those areas as well. For example, Sobolewski and the three Ph.D. students, three master’s students and five undergraduates in his lab work on single photon detectors -- which have applications for quantum cryptography and quantum computing -- and with terahertz radiation, which has multiple applications, including the ability to scan packages for airport security. Though Sobolewski maintains office hours at 425 Computer Studies Building, his main office, his labs and all of his graduate students are based at LLE. Except on the days he teaches two electrical and computer engineering classes at River Campus each fall, he spends most of his time at LLE. And he and his students like it that way. “My students are very proud to be part of LLE because it has such national recognition. They have no problem findings jobs. They advertise themselves as working at LLE. It really helps,” Sobolewski says.